Part one of a two part jewellery glossary of beading terms and jewellery making terminology. Combining clear images with easy to understand dictionary like definitions, this bead glossary also provides links to more in depth content and bead resources. It can be used as a beading A to Z reference guide to dip into as needed, or as a beading and jewellery glossary for beginners to help broaden beading and jewellery making knowledge. It is particularly effective when used alongside our Beading Guides, Histories, Theories and Tutorials, or in conjunction with our Gemstones & Minerals Glossary and Venetian Glass Making Glossary. To allow for growth this informative beading dictionary is presented in two cross referenced sections Glossary of Beading & Jewellery Making A to J and Glossary of Beading & Jewellery Making K to Z. A jump to index is provided at the top of each bead guide to help you find information quickly. This Glossary of Beading Terms is also available as a free PDF. These edible sea creatures are members of a large class of molluscs that have one piece shells with an iridescent interior. These shells have a low and open spiral structure, and are characterized by several open respiratory pores in a row near the shell’s outer edge. The thick inner layer of the shell is composed of a dichroic substance called nacre or mother-of-pearl, which in many species is highly iridescent, giving rise to a range of strong and changeable colors, making it ideal for jewellery and other decorative objects. Iridescent nacre varies in colour from silvery white, to pink, red and green-red, through to deep blues, greens and purples. Read more in our Gemstones & Minerals Glossary. Above are examples of Paua and Red Abalone. Similar in purpose to a Focal Bead, this is a bead that forms the focus for a piece of jewellery, but on this occasion rather then through its size, it is usually through contrast. So for example it will be an unusual shape, of a different colour, or differing in pattern or texture. Use of an acid to create a Matte finish on glass or other materials. A man made resin or thermoplastic used to make moulded plastic beads or applied to the surface of beads to give them colour or Lustre. Due to improvements in technology acrylic beads are an economical alternative to glass and crystal, being durable and light. Click to view a selection of our Acrylic Beads. Above are some examples of typical acrylic beads including faceted, starflake, pony and star. Used to keep thread knots from unravelling and to keep small items such as beads in place. Also known as bead cement or glue. Click to view a selection of our Bead Adhesives. Above is a tube of G-S Hypo Cement used for gluing beads in place, strengthening knots and other creative applications. Sometimes called Slave Beads, these were decorative beads used between the16th and 20th centuries as a currency to be exchanged for goods, services and labour. Made mostly by Venetian merchants they were used to ease the passage of European explorers and traders, mainly across the African continents, but trade beads were also used in North America and Canada, and throughout Latin America. The production of trade beads became so popular that literally tons of beads were used for this purpose with the beads used as ballast in ships for the outbound trip. The beads and other trade items were then exchanged for human cargo as well as ivory, gold and other goods desirable in Europe and around the world. In part, the success of this form of currency can be attributed to the high intrinsic value African people placed upon decorative items. Africans often used beads for currency and wealth storage, with social status determined by the quality, quantity and style of jewellery worn. This created a high demand for trade beads in Africa. To this end the beads were usually large, bright, colourful and often cylindrical in shape. To learn more about the European glass industries role in this trade read our History of Venetian Glass. Above are two Venetian glass African Trade beads from the early 1900s – a feathered elbow bead and a millefiori bead. Is a microcrystalline variety of Quartz characterised by its fineness of grain and brightness and range of colours. Agates are normally associated with volcanic rocks but can also be found in certain metamorphic rocks. Agates have been used in jewellery making since ancient times with archeological finds in Crete placing its use to the Bronze Age. Read more in our Gemstones & Minerals Glossary. Above are examples of Banded, Blue Lace, Condor (Argentina), Dendritic (Kazakhstan), Fire, Green, Honey Brush, Moss, Polka Dot, Red, Rosette and Scottish Agates. Above is a run of Toho Aiko beads in Dark Amethyst. A form of Gypsum that is soft enough to be hand carved into beads, jewellery, or more ambitiously statues. It gives beads a dense translucent white or tinted finish reminiscent of old Milk Glass. A metal mixture made from the combination of two or more metallic elements or metallic and nonmetallic elements usually fused together or dissolved into each other when molten in order to provide added strength and durability. Brass, White Gold, Sterling Silver and Pewter are examples of alloys with, for example, brass being an alloy of zinc and copper. A hard abrasive available in various grades and grain sizes for use in jewellery making. Is a green variety of microcline feldspar and is found in coarse granite or pegmatite. It is mostly opaque and derives its name from deposits originally found in the Amazon. It is often found with white, yellow or grey inclusions and a silky lustre or silvery sheen. Colours are blue green and pale green. These stones can be found in Brazil, India, Kenya, Madagascar, Namibia, Russia, United Sates and Zimbabwe. Read more in our Gemstones & Minerals Glossary. Above are examples of Chinese, Pale Green (with grey inclusions), and Russian Amazonite. Fossilised tree sap resin that is cut and polished and used as a gemstone. It is typically golden brown in colour with translucent qualities. It is also a descriptive term relating to the colour of amber. Read more in our Gemstones & Minerals Glossary. Above are examples of Baltic, Black Sarawak (Borneo), Ciapas (Mexico), Dominican Blue, Golling (Austria), Lee Creek (USA), New Jersey (USA) and Sabah (Borneo) Ambers. A form of Quartz, this semi precious stone has a purple translucent appearance created by the presence of iron and manganese when it was forming. Read more in our Gemstones & Minerals Glossary. Above are examples of African, Brazilian and Deep Purple coloured Amethyst. An ornament of gold, silver or other material worn around the ankle in the same manner as a bracelet on a wrist. Is the process of reheating a material and then cooling it slowly to make it stronger and more pliable. Examples of annealing would be the strengthening of metal wire whilst in turn making it easier to work with, or when working with glass to prevent say lampwork beads from shattering. Like Vintage Beads this is a subjective description used to indicate the age of an item. Strictly speaking an antique is an item over 100 years old but is also a term that can be used to describe styles and materials from another era such as 1930s Bakelite, Victorian cut beads, Native American beadwork, etc. Since this gives these beads a certain rarity, they are often sought out by designers wanting to create a unique one of a kind jewellery piece you won’t find anywhere else. Click to view a selection of our Antique and Vintage Beads. Three antique ojime beads made in the Orient for the Western market during the Meiji Taisho era or the early 1900s. A process or surface finish used to give beads and jewellery components an aged appearance. An example of an Antique Finish on a pair of split ring chain keyrings. Is a group of phosphate minerals found in sedimentary rocks. Apatite is the defining mineral for 5 on Mohs Scale of Hardness and occurs in colourless, yellow, blue, violet or green. As a gemstone their use is infrequent but good transparent stones of clean colour when faceted correctly can be bright, vitreous and strongly coloured. Usually they are cut as cabochons providing a cats eye effect. Read more in our Gemstones & Minerals Glossary. Above are examples of Asparagus Stone (Spanish), Blue, Cats Eye and Violet Apatite. The art of sewing beads onto leather or fabric. This gemstone is named after its resemblance to seawater with its coloration created by iron. Aquamarine is a hard gemstone, which makes it an excellent choice for jewellery that will be worn frequently. However, it should be stored in a dark place as it can become paler when exposed to sunlight. Colours are light to dark blue, blue green. These stones can be found in major deposits in Brazil. They are also found in Australia, China, India, Kenya, Madagascar, Mozambique, Myanmar , Namibia, Nigeria, the United States, Zambia and Zimbabwe. Read more in our Gemstones & Minerals Glossary. Above is an example of Light Blue Aquamarine. Is a form of calcium carbonate, like Coral or Marble, and is named after Molina de Aragon, Spain, where it was first found in 1790. It is transparent to translucent and is usually colourless or white when pure, but impurities can bring about shades of yellow, blue, pink or green. Read more in our Gemstones & Minerals Glossary. Above are examples of Blue, Peruvian Striped and Orange Aragonite. Often reduced down to AB this is a micro thin layer of metal giving a rainbow Iridescent finish to a crystal or glass bead. First developed for use on crystals by Swarovski when working in association with the fashion designer, Christian Dior, in 1956. It is extremely popular and is now applied widely by all bead manufacturers. This is a durable finish as the metal is permanently bonded with the glass. This finish is also known as Rainbow, Iris and Fancy. Click to view a selection of our Aurora Borealis Beads. Above is a set of Black Diamond Round Fire Polished Czech Glass Beads with Aurora Borealis finish. Unit of measurement for Seed Beads. It is usually denoted by a number followed by a slash and a zero or a degree sign (e.g. 11/0 or 11°). The higher the first number, the smaller the bead. To learn more about Seed Beads and Seed Bead sizing read our History Of Seed Beads. Is a glass paste composed of very fine copper flakes or powder which is used to decorate glass beads or to simply add sparkle. This technique originated in Venice in the 15th century but the powder is used in both genuine Murano glass and by many of its imitators. Learn more in our Glossary Of Venetian Glass. Above is an example of applied Aventurina decoration on a vintage orange and black pinched nugget bead. This gemstone is a form of Chalcedony that contains small mineral inclusions. These additional materials, usually mica or iron oxide, give the stone a glistening effect. Aventurine’s granular appearance and particular translucence are its most distinctive characteristics. It is also called aventurine quartz. It is usually dark green but it also comes in reddish brown and golden brown. These stones can be found in Austria, Brazil, India, Russia and Tanzania. Read more in our Gemstones & Minerals Glossary. Above are examples of Blue, Green and Red Aventurine. This is a multi purpose beading tool which can be used, amongst other things, for helping to create knotted designs, clearing clay release blocking glass bead holes, or for making indentations, holes and fine line engraving in polymer or precious metal clays. Read more in our guide to Beading Tools and Jewellery Making Tools. Above is a typical Beading Awl. Is a soft, deep blue copper mineral produced by weathering of copper ore deposits. It usually occurs with green Malachite, which may form green stains or specks on Azurite crystals or aggregates. The two minerals sometimes occur banded together, forming what is called Azure Malachite. A rarer Azurite mixture, known as Bluebird, is Azurite mixed with dark red Cuprite. Azurite is used for beads and as jewellery but due to its softness and tendency to lose its deep blue colour as it weathers its uses are limited. Heating also destroys azurite easily, so all mounting of azurite specimens must be done at room temperature. Read more in our Gemstones & Minerals Glossary. Above is an example of Azurite with small Malachite inclusions. A basic stitch used to apply beads to fabric. This stitch can used to secure each bead in turn, every other bead, every third bead and onwards depending on the resilience required for the garment or design. A rectangular shaped small diamond or gemstone, usually used as the centre piece of a ring or used repeatedly to form a bracelet. Above is an example of a Baguette cut diamond. A jewellery finding that is used to connect and position a pendant onto a necklace using clips, glue or a ring embedded in the pendant itself. It is meant to slide onto the chain rather than to be soldered to it so that the pendant is not permanently part of the chain. Click to view a selection of our Pendant Bails. Above is an example of a pair of bronze finish metal Bails. A hard mouldable plastic invented by Leo Baekeland in 1909, which helped to define the jewellery of the 1930s, whilst remaining highly collectable to the present day. Not to be confused with Catalin which came later in the 1930s, was made by a rival company, and had a far wider range of colours. Above is an example of a Bakelite dog broocha and an orange barrel bead. Handmade sterling silver jewellery findings that are produced in Bali, Indonesia. Typically very ornate these pieces have a silver content of no less than 92.5%. A bracelet made of solid or hollow metal, or wire. It may be a single piece that is placed over the hand to hang loosely or made with an integral hinge so that it can be opened and fastened around the wrist. Click to view a selection of our Bangles. Above is an example of a hinged silver plated Bangle with cabochon setting. Also known as a Toggle Clasp this two piece finding consists of a ‘T’ shaped bar that fits inside and then straddles a loop to secure the item of jewellery. They are perfect for heavier necklaces or where the necklace needs to be clasped at the front as part of the decorative design of the piece. The loop is usually circular but can also be heart, leaf, square or star shaped. Click to view a selection of our Bar and Ring Clasps. Above is an example of an antique bronze Bar and Ring Clasp. An irregularly shaped bead. Often a term applied to Pearls, but it can be applied to any bead type whether natural, cultured or manufactured. Above is an example of a Baroque Bead in the form of an emerald green transparent pressed glass Czech bead. Not too surprisingly these beads are barrel shaped and can be made of any material including glass, metal, plastic or wood. Above is an example of some handmade horn Barrel Beads. A Clasp made of two parts that screw, snap or use magnets to come together to form a barrel shape. They are usually used to secure necklaces. They are available in most metallic finishes as well as ivory, black and Vintage. Click to view a selection of our Barrel Clasps. Above is an example of a barrel clasp in a silver finish. Above is an example of a decorative bronze finish filigree Barette. Any metal other than gold, silver or platinum – which are all considered Precious Metals. Examples would include brass, bronze, copper and nickel. A decorative but inexpensive piece of jewellery. This fashionable one piece plastic statement ring would qualify as a bauble. Small pierced objects made of natural or man made materials that can be strung onto thread or wire for the creation of jewellery. They can be made of bone, clay, glass, metal, paper, plastic, porcelain and stone but beaders are ever inventive and other materials are used. Typically the defining characteristic is that they will have a hole for stringing purposes. Useful to have for planning out jewellery designs ahead of stringing. They come in different sizes, but all have grooves into which you place your beads and components so that you can try out layouts. Some have multiple grooves so that you can plan multi stranded designs. Around the outside of the grooves are measurements to help you determine the length of the finished piece. Click to view our selection of Bead Boards. Above is a Beadalon bead board. The boards come in a number of different sizes to allow for large and small jewellery stringing projects. A pair of bead caps can be used to top and tail a bead. They are generally domed in shape to neatly fit round a bead. Bead Caps can be purely decorative, serving to off set a bead but they can also be used to help cover up a large bead hole giving a neater finish. Click to view a selection of our Bead Caps. Above is an example of a vintage silver plated Bead Cap with Art Nouveau like detailing. Used to keep thread knots from unravelling and to keep small items such as beads in place. Also known as bead adhesive or glue. Click to view a selection of our Bead Cements. A clasp mechanism that is hidden in a bead or pearl using a magnet, screw, tab or bayonet to ensure a secure closure. A metal cone shape that is used to secure and cover the ends of several strands of beading. Above is an example of bronze finish cone end bead caps. A bead crimper or pair of Crimping Pliers help finish off strung jewellery designs by crimping (or neatly squashing!) crimp beads at the end of the strand to prevent the beads from sliding off. A technique for adding beads to fabric using traditional embroidery stitches, some of which are detailed in this glossary. A small frame that can be strung with warp threads so that a beaded weft can be used to create a piece of bead weaving. Above is an example of a table top Bead Loom. Make life easier and stop those errant beads from rolling away! A Bead Mat can be a piece of towel or fleece material that has enough pile to its surface to prevent speedy rolling. A bead mat will also protect your work surface. Above is a typical three coloured pack of Bead Mats with the different coloured mats providing better contrast for different colour beads. A simple fastner that is clipped to the end of a bead strand whilst stringing to avoid beads falling off the end. It is particularly useful for multi strand designs. See Stopper Beads. An example of a Bead Stopper. The thread is passed through one of the coils of the stopper to secure it in place, with the side loops allowing the stopper to be secured to a work surface. Bead threads are specifically designed to be strong and stretch resistant. Synthetic fibres reduce the risk of fraying or rotting. Sometimes they are treated with a coating to reduce the slippage of knots. Click to view a selection of our Beading Threads or read our Guide To Cords Threads And WIres. Above are three rolls of Nymo Size D bead thread. A metal Finding used to finish off a strung necklace or bracelet by hiding the stringing knots. The knot sits inside the concave piece of the tip which is then folded over and closed shut. The loop is used to attach the bead tip to the clasp. See also Calottes. Above are some gold plated metal Bead Tips or Calottes. An individual bead constructed of small beads such as Seed Beads or crystals, stitched together, usually over a base bead, to form a three dimensional shape. Above is an example of a Beaded Bead using Peyote stitch and Seed Beads. Are used to give a professional finish to the ends of a multi stranded necklace. The metal cone covers and contains the knotted strand ends. Above is an example of some large decorative bronze finish beading cones. These are essential if you are working with any type of supple thread. English hard needles have an eye no wider than the shank of the needle so they are very slim and will pass through the smallest of holes. Collapsible or large eye needles are easier to thread and they reshape as they pass through the bead. The higher the number of the needle, the finer it will be. The longer needles will curve when you use them, but many beaders prefer them this way as it makes them more dexterous! Read our Guide To Beading Needles or view our John James and Beadalon needles selection. Above is an example of a mixed size pack of John James Hard English Beading Needles. Useful for handling tiny Seed Beads and unpicking knots in stringing materials. Above is an example of a pair of fibre tipped Beadalon beading tweezers. Above is an example of Olivine Tiger Tail Beading Wire 0.38mm by 80 metres. Brings weaving techniques to beading allowing the creation of accessories, jewellery, and artworks. Weaving can be done on a Loom or with a needle and thread, otherwise known as off loom. A natural wax which in beading is primarily used to condition beading thread to make it easier to work with. Because it is sticky it is particularly useful when using multiple threads reducing the need to reposition the needle when thread is doubled up. It should be used sparingly so as not to clog the opening in smaller sized beads reducing the number of passes possible. Above is a block of beeswax used to condition beading thread. Large, irregular or Baroque semi-precious stone beads usually made from Agate. They are so called because it was believed that Agate was an attractor of wealth. Traditionally these beads were worn on necklaces by beggars to attract alms. Above is an example of a pale gold coloured Bell Cap. Are useful for general wire work, holding, and especially when working for prolonged periods of time for example when making Chain Maille. The plier tips are bent so that the users wrists are kept at a comfortable working angle. Above is an example of a pair of Beadalon Bent Chain Nose Pliers. A type of jewellery setting, usually made of metal, used for encircling and securing a crystal, stone or Cabochon. A continuous groove is cut into the setting to seat the faceted stone. The metal above the groove is then burnished or folded over the edge of the stone to provide a secure setting for the piece. An extremely popular bead shape particularly when it comes to crystals! Bicones resemble two cones stuck together flat end to flat end, and they can be faceted or gently rounded. Click to view a selection of our Bicone Beads. Above is an example of some gold plated metallised Bicone Beads. Semi precious and precious stones assigned to each month or zodiac sign, purported to enhance qualities in the wearer or bring good fortune or health. There are several lists of official birthstones and these vary. The birthstones list that Big Bead Little Bead uses is provided by the National Association of Goldsmiths of Great Britain, created in 1937. It includes both precious and semi precious stones, as each month is association with a gemstone and a mineral. Visit our Guide To Birthstones for this list as well as the American version. A cultured pearl from Lake Biwa in Shiga Province, Japan. Only those beads cultivated in this freshwater lake can be called Biwas as opposed to freshwater cultured pearls. Typically relates to Bugle Beads and Seed Beads where the bead hole has been lined with a black finish giving greater depth to the bead colouring. A collection of clear Czech glass farfalle beads with a Black Lining. This is an opaque, green, spotted variety of Chalcedony. Read more in our Gemstones & Minerals Glossary. Above are two variations of Bloodstone. Is a catch all term to describe jewellery for pierced parts of the body other than ears. It also covers fashionable items such as toe rings. Is a nostalgic name for glass sourced from Czechoslovakia. Historically this Eastern European region was named Bohemia and it was here that glassmaking grew into an art form in the late 1700s. To learn more read our informative History Of Czech Glass Beads. A two piece clasp with a tab or tongue which is inserted into a decorative box section which can be accented with gemstones, enamel, filigree or inlay work. Some claps come with safety latches or chains which prevent the wedge shaped tongue from pulling out and allowing the jewellery piece to fall off. They are typically used for lightweight necklaces, bracelets and anklets. Above is an example of a vintage gold box clasp with a white glass dome. An ornamental chain worn about the wrist, arm or ankle. Bracelet length will vary according to the style and the dimensions of the wearer. To work out the length of a bracelet, measure the circumference of the wrist and add 1.5 cm, then subtract the length of the closure method chosen or refer to our Bracelet Size Guide. To see how many of a particular sized bead are needed for a bracelet use our handy Online Bead Calculator Tool also found in the menu bar above. Above is a monochrome bracelet from our Create Your Own range of jewellery kits. A metal produced from varying proportions of copper and zinc with different alloy formulas producing different brass colours and levels of ductility or workability. A small decorative item such as a Charm designed to be hug from a chain. An example of a Breloque in the form of a silver comedy mask charm. Refers to the stitch in which Seed Beads are sewn together to resemble the spacing of a brick wall. In reference to a gem this refers to the brightness of the stone, which is related to the surface polish and the internal reflection of light from the back facets. Pear or tear shaped beads or gemstones typically used for drop earrings. They can be faceted or smooth. Above is an example of a Preciosa Crystal Briolette. An Alloy of copper and tin in various proportions, sometimes with small traces of other metals added. A brown gemstone of the pyroxene mineral family. This iron like substance creates a metallic bronze like sheen on the surface of the gemstone. Read more in our Gemstones & Minerals Glossary. Above is an example of Bronzite. Any decorative piece of jewellery that can be pinned to clothing typically using a brooch back or button fastener. These are typically manufactured with a flat metal plate attached to a hinged pin component usually with a safety catch. The pin is used to secure the finished brooch to a garment whilst the plate can be used as a base for a jewellery design. These designs can be built up with beads, cloth, embellishments, findings and wirework. Many brooch backs have holes in their metal plates to aid gluing and wiring. Above is an example of some silver plated metal brooch backs. Short thin tubes of glass which are usually less than 2mm thick. They are made by drawing out a long tube of glass and then cutting this it into shorter lengths. They are good for shine and swing and were famously used on flappers’ dresses in the 1920s. Read more in our informative Guide To Bugle Beads, or click to view a selection of our Bugle Beads. Above are a number of hexagonally faceted vintage emerald glass Bugle Beads from the 1920s. A length of wire worked over a thread end to produce a tight coil or spring to provide added protection and a professional finish. See also French Wire. Above are a handful of bronze finsh butterfly earring stoppers. A flat backed domed or faceted bead that is usually applied using glue to a setting or woven into position. As with normal beads they come in a great variety of shapes, sizes, materials, and finishes. Above are a number of turquoise coloured howlite round cabochons. Also known as Stamping is a finding or charm made from sheet metal which has been cut and shaped between two dies in a press. The pattern is formed in relief with a hollow or concave reverse. Above is an example of a vintage raw brass pleated cagework stamping. Calcite is an anhydrous carbonate, and one of the most widely distributed minerals on the Earth’s surface. It is also the defining mineral for 3 on Mohs Scale of Hardness. Read more in our Gemstones & Minerals Glossary. Above are examples of Blue, Golden, Mangano and Yellow Calcite. A tool or instrument used to precisely measure the dimension of small objects such as beads. In beading they are usually in the form of a graduated ruler with one sliding jaw and one that is stationary allowing measurements to be taken precisely from the ruler. Above is an example of a set of brass Cailpers. Also known as a Bead Tip, Clam Shell or Knot Cup. Small metal finding used to hide the method of ending a strand. Two halves of a hollow sphere encase a knot or crimp thereby giving the appearance of a neat end. Calottes can be simple or decorative. Above are some gold-plated metal Calottes. Traditionally, cameos are made from shell or gemstone. The surface is carved so that the design (perhaps a head and shoulders portrait) is raised and of a different colour to the background. Modern cameos are often made of plastic or resin but traditionally they would made from natural materials, glass and porcelains. Above is an example of a Cameo charm. A unit of weight in part used to determine the relative value of precious stones. One carat equals one fifth of a gram. A form of steel that contains a proportion of carbon plus other trace alloys. It also denotes a generic type of steel other than stainless steel. Is a gemstone from the quartz family. It is a warm reddish orange or brown colour. These stones can be found in Brazil, India, and Uruguay. Read more in our Gemstones & Minerals Glossary. Above is an example of Carnelian. Is a decorative or engraved piece with a symmetrical ornamental shape. Originally used to depict the names of the Pharaohs in Egypt. A vintage Egyptian revival Cartouche. Also known as Fibre Optic Beads. These glass beads are called cat’s eye beads because of the iridescent white streak that glows from the middle and resembles a light-reflecting cat’s eye. This is due to light refraction within the bead. Above are some Royal blue Cats Eye Beads. A style of glass bead manufactured in the Czech Republic using a steel mould to form a pressed glass bead which is then given a coloured surface finish. By grinding in facets and polishing the beads the base glass is presented on all sides with the end of the beads retaining their surface finish. Above are a set of turquoise and yellow Czech glass cathedral beads. Was one of the first plastics to be used in beadmaking pre-dating Bakelite and Catalin by several decades. As with all plastics decorative items were easy to mass produce and affordable and came into their own with the bold geometric designs of the Art Deco period. Above is a 1930s shiny maroon coloured celluloid bead with a deeply carved art deco pattern. A medium, including clay, parian, porcelain, terracotta, raku and earthenware, that can be modelled, moulded, and pressed before firing to harden it. After which it is usually decorated with glaze or paint. Above is an example of Ceramic in the form of a twilight fern heart glazed pendant. A glass bead finish that is used with translucent or transparent beads to give a shiny pearlised finish. The use of Ceylon before a colour indicates the addition of a lustre coating to the exterior of a bead or an inside colouring to an opalescent bead. Above is a length of sterling silver belcher Chain. A short length of chain, beaded chain or other necklace material with a connector on one end and a loop on the other used to lengthen a necklace. Maille, also known as Chain Mail, Chainmail, Chainmaille, Mayle, or just plain Mail. It is a flexible material composed of small interlocking metal rings or loops of chain. It was historically used to make body armour, but is commonly seen today in jewellery, sculpture, and fashions. A square of Chain Maille. Are the perfect all purpose tool and should be on the list of essential jewellery making tools that you will need. They are used to bend, cut, hold and manipulate wire and findings. They are used for similar jobs to flat nosed pliers but have a smaller jaw and a pointed tip which makes them ideal for working on small items and in small spaces. They are also smooth faced to avoid leaving marks. Above is an example of a pair of Beadalon Chain Nose Pliers. Are used at the end of a chain to attach a lobster, spring or trigger clasp too. The smaller hole is attahced to the chain using a jump ring with the larger hole used to fasten the clasp through. A handful of gold plated clasp or Chain Tags. This gemstone, found in Brazil, India, Madagascar, Namibia, Sri Lanka, the United States, Uruguay and Zimbabwe, has a semi transparent or translucent quality alongside a solid colour, commonly pale bluish grey. It also has a near wax like lustre. Colours are blue, purple, pink, white, yellow, orange, and gray with blue and purple the most popular hues. Read more in our Gemstones & Minerals Glossary. Above are examples of Pale Blue, Grey and White Chalcedony. Above is a pair of silver plated chandelier findings or droppers. Originally these were Czech made size 13 Seed Beads, with one hand cut side, making them slightly faceted. Now it is possible to buy Seed Beads of other sizes with a single facet, and these are called one cut or true cuts. Read our Guide To Seed Beads to learn more. Small findings used to produce a neat professional ending to a strand. Two halves of a hollow sphere are used to encase a crimp or knot to provide a neat and secure end. Above is an example of silver plated Charlotte Crimps. Above is a pewter cockle shell Charm. A typical example of a Charm Bracelet with thirteen sterling silver charms. A jewellery finding that can be attached to a chain or cord with a jump ring or bail. The bottom portion of the hanger or chain holder can be opened to add individual or multiple charms. Used by jewellery designers for striking chasing tools with the large head reducing the possibility of missing! The ball side of the hammer is used for flattening rivets or adding decoration to metal. Typically used alongside a metal bench block. A wooden handled jewellers Chasing Hammer. A jewellery setting where the stone is held in place by metal claws. This term also refers to a foil backed cone shaped crystal or stone where the top circular edge is bevelled running to a point on the underside. Some chatons are designed to be set and used in chain work and therefore do not have the foil backing. These chatons are faceted the same on both sides. Also known as Rosetta or Star Beads are made of multiple layers of different coloured glass laid down in a corrugated fashion so as to form a starburst when the ends have been ground away thereby revealing the pattern. They were first produced in Murano at the end of the 14th century and to learn more you should read our Venetian Glass Glossary. Above is a contemporary Venetian chevron bead produced by acclaimed Italian bead artist Luigi Cattelan. These lead free glass beads are made to resemble Swarovski Crystals. They are less expensive than the crystals they are trying to imitate and as such the difference in quality is noticeable. The chlorites are a group of phyllosilicate minerals commonly found in igneous rocks. Read more in our Gemstones & Minerals Glossary. Above is an example of Chlorite. A tight fitting Necklace worn at the base of the neck. Measures about 16 inches / 40.6 cm depending on neck size. To see how many of a particular sized bead are needed for a choker use our handy Bead Calculator Tool. A beautiful Miriam Haskell cream coloured pearl choker necklace with crystal drop. The mineral or gemstone chrysoberyl is an aluminate of beryllium. The name is derived from the Greek for a gold-white spar. Read more in our Gemstones & Minerals Glossary. Above is an example of Chrysoberyl. Chrysocolla is a very soft stone that comes in a bluish green colouring. Read more in our Gemstones & Minerals Glossary. Above is an example of Chrysocolla. Is a gemstone variety of Chalcedony that contains small quantities of nickel. Its colour is normally apple green, but varies to deep green. Read more in our Gemstones & Minerals Glossary. Above are examples of standard and Citrine Chrysoprase. Is also known as Grass Turquoise. Though normally green in colour, chrysotine can also be cream coloured or light yellow. Read more in our Gemstones & Minerals Glossary. Above is an example of Chrysotine. Has come to refer to different things over time. Originally a soft brick red stone formed of mercury sulphide carved into intricate shapes, it now more commonly refers to hand carved lacquered wooden beads originating from China, or moulded Polymer Clay beads imitating the aforementioned carved and lacquered beads. Above is a large vintage hand carved chinese patterned Cinnabar bead. A yellow to brownish variety of quartz which is nowadays mis sold as Topaz. These stones can be found in Argentina, Brazil, Madagascar, Myanmar, Namibia, Russia, Scotland, Spain, and the United States. Read more in our Gemstones & Minerals Glossary. Above is an example of Citrine. Above are some gold plated metal Calottes. A measure of the clearness or absence of impurities in a gemstone. A jewellery component used to join two ends of a piece of jewellery together. Available in many different styles and sizes. To view a selection of our Contemporary Clasps click here or to view our Vintage Clasps click here. Above is an example of a silver plated vintage three strand clasp with small hematite stones for subtle sparkle. An enamelling technique. Strips of bent wire are soldered onto a metal base (usually both these are of copper) to form a pattern. The spaces between the wires are called cloisons, and these are filled with enamel. The object is then fired and polished several times. The exposed wire outline is sometimes given a gold plated finish. There are other cheaper to produce methods that also produce a finish referred to as cloisonné, but the best quality Cloisonne work is produced as described above. Above is an example of a floral Cloisonne Bead with black background. Is glass pigmented none too surprisingly with the element cobalt. This gives the glass a rich deep blue colouring. It is also refers simply to the same deep colour blue but without the presence of cobalt! An example of rich cobalt blue lampwork glass beads. Above is a typical larger than life modern dome shaped cocktail ring. A simple metal bead manufactured using coiled wire and similar in appearance to a spring. Some coil beads can be pinched like a crimp bead. Above is a handful of coil beads shaped like miniature cotton reels. A simple metal bead manufactured using coiled wire and similar in appearance to a spring but with an end loop. Wire-working techniques that don’t require solder or heat – i.e. cutting, wrapping, hammering, coiling and bending. A necklace piece similar in style to a choker but comprising three or more strands of beads that fit snugly against the neck. Originally made fashionable by Queen Consort Alexandra, the wife of Edward VII, in the late 1880s they experienced a revival in the 1960s. When designed with a front facing clasp they are known as a Plaque de Cou. Typically a small functional self contained element used in jewellery making and beading. A group of Cone Beads handmade from rolled paper. Also know as End Cones or End Caps. A cone is used at the end of a multi strand jewellery piece to gather together the strands whilst hiding the knots and crimps. They can also be used to make bead or chain tassles. Glass beads rolled in tiny pieces of glass while the bead is still hot. Also known as Sugar Beads. Above are three round amethyst confetti or sugar beads. Comes in black, reds, and pinks and has a distinctive wood-grain texture that can help identify it as the real thing – against the plastic, glass, porcelain and stained bone which is used to imitate it. Sponge coral, when polished smooth, has visible pores like a sponge. Bamboo coral grows in segmented branches that resemble bamboo stalks, with beige/brown sections partially covering the black under layer. Coral is much softer than other gem materials, and as a result it should be stored carefully to avoid scratches. Cosmetics, hot water and bright daylight are damaging to it. It can be found in the Mediterranean Sea or in the Pacific off Japan and Taiwan. Read more in our Gemstones & Minerals Glossary. Above are examples of Apple, Fossil and Red Coral. Above is an example of some Blue Bird Beading Cord. Another name for Folding Crimps. Above is an example of Cord Ends or Folding Crimps in black antique finish. Hollow metal spheres or beads made from corrugated tubing giving a repeating pattern of grooves and ridges. Twist corrugated beads have corrugations that spiral around the bead horizontally instead of vertically. These beads are also known as Formed Beads. Above are two vintage raw brass tear drop fluted or corrugated beads. Corundum is the crystalline form of aluminium oxide and one of the basic rock-forming minerals. It is the defining mineral for 9 on Mohs Scale of Hardness. Read more in our Gemstones & Minerals Glossary. Above is an example of Corundum. Examples of Miriam Haskell costume jewellery running from left to right a Turquoise Brooch c1940s, a Gilt Cuff Bracelet c1940, a Red and Brown Necklace c1945, and a Yellow Necklace c1945. Are small rounded shells with a creamy porcelain like quality, a narrow slit like opening, and interestingly patterned outer surface. Above are examples of polished yellow Cowrie sea shell beads. Beads are made by plunging molten glass into water, causing the exterior to crack whilst the still hot interior stays solid. A Venetian glass making discovery. Above are examples of Emerald and Crystal Crackle Glass Beads. These are tiny metal round beads made of a soft metal. They can be used for helping attach Necklace or Bracelet beading wires to clasps, holding beads in position on stringing wire or cord and for holding together multiple wires. Crush or flatten the crimp with flat nose or crimping pliers to lock its position on the wire or cord. Above is an example of black antique finish metal Crimps. A decorative metal cover that is closed over a Crimp Tube to provide a clean finished look to a jewellery design. Vintage raw brass crimp covers. A Crimp Bead made into a tubular shape rather than round. These little tubes negate the need for knots in the stringing material. This is a specialist two part tool that will give a neat finish to your crimp beads. A pair of flat nose pliers will flatten a crimp bead – perfectly functional – but Crimping Pliers will produce a rounded shape to the crimp that looks better and more professional if you are leaving them exposed.These pliers have two different shaped holes (when the jaws are closed) to squash and then round the crimp so that it securely grips the wire. Some crimping pliers have several different sized holes so that they can be used to crimp different sized findings. Above is an example of a pair of Beadalon Crimping Pliers. The hanging hole passing through the end of a Drop or Pendant. Slightly oval glass beads resulting from the tumbling process used in their manufacture. Typically 6 to 9mm in diameter with a 2mm hole or larger. Pony Beads have similar qualities but are larger still. Above is an example of Vintage Marbled Topaz Crow Beads. A clear transparent mineral formed from crystallised quartz. Read more in our Gemstones & Minerals Glossary. Above is an example of Crystal. Glass with a high lead content (typically greater than 30%) which gives it a brilliant transparency and shine. As the lead is contained within the glass crystal beads there is no issue with toxicity. Swarovski and Preciosa are the two big names that make crystal beads and pendants, but crystal is also available from Chinese manufacturers. Crystal beads are nearly always faceted to show off the light refracting qualities of the glass, the best quality beads are precision cut by machine. A synthetic substitute for diamonds. To the untrained eye they are very similar in appearance though Cubic Zirconia has a Mohs hardness rating of 8 as opposed to 10 for a Diamond. They are also result in a heavier stone than similar sized diamond. A process perfected in Russia, they have been available commercially since 1976. A wide bracelet which is either slipped over the wrist or hinged. Named after its resemblance to the size and shape of the cuff of a shirt sleeve. Above is an antique silver filigree style cuff bracelet. A closure used to fasten the two sides of a shirt sleeve cuff. Originally composed of two metal buttons separated by a short length of chain, nowadays a cuff link is commonly based on a swivel style finding, with the mechanism hidden by a cabochon, stone or small decorative plate. Above is an example of an antique copper finish Curb Link Chain. Are compact round headed cutters used for general wire work. They are used for cutting most wire end, with side cutters putting a neat finish on your wire (sand the end of the wire for a super smooth finish). However, Memory Wire is a different kettle of fish as it is so tough, and needs to be cut either with specialist Memory Wire Cutters, or a pair of sharp household pliers. Use your jewellery pliers and risk ruining the jaws. Likewise do not be tempted to use scissors for wire cutting as even the finest wire will make grooves in the blades and ruin them. Are generally beaded Head or Eye Pins finished with a loop, or a small object with a top loop, attached to bracelets, necklaces or earrings in the same manner as a charm might be. And yes, they dangle . . . adding extra movement to piece of jewellery. Above are a number of unusual vintage white lucite beads in brass wired dangles. A jewellery making technique used to add shape and form to a normally flat ornament, for example doming a plate metal ornament. Usually formed using a Dapping Block, Dapping Punch or Press. Above is an example of Miyuki Delica beads in lavender blue transparent lustre. The unit of measurement used to denote the thickness of Silk Thread. Diamond is the defining mineral for 10 on Mohs Scale of Hardness. Read more in our Gemstones & Minerals Glossary. Above is an example of Diamond. Above are a pair of box clasps with central diamante faceted stones. This incredibly beautiful glass of oily, rainbow iridescent colours is the result of super high-tech aerospace engineering. Multiple layers of metal oxide are applied to a base coat of glass to the thickness of approximately 1/40th of a sheet of paper. The oxides are applied using an electron bombarder inside a vacuum chamber. As many as 50 layers can be added in specific order and thickness to create the result desired. The thin layers of metal over glass allow some wavelengths of light/colour to pass through and others to reflect, and this creates the shimmering chameleon visual effect. The combination of the metal oxide types used determines the colours presented, and the base glass can be of any colour. The presence of tiny amounts of metal particles in glass can create a similar effect, and this is a far older technique – see the Lycurgus Cup in the British Museum collection that dates to 4th century A.D. Above is an example of a striking dichroic glass pendant. A very short cylindrical sliced bead with parallel faces and a central or tabular hole (from edge to edge). In effect a squashed round bead! Above is an example of vintage light sapphire glass Disc Beads. Similar to a Choker, this is a wide band of material worn as a necklace high around the neck often with a focal bead or pendant positioned at the front. Is a carbonate mineral composed of calcium magnesium carbonate. It comes in hues of white, grey, pink, green, brown and black. Read more in our Gemstones & Minerals Glossary. Above is an example of Dolomite. These are flattened disc like beads with a large central hole usually fashioned from glass, stone or wood. Above is an example of a semi precious Donut Bead in red jasper. A component used to conceal knots at the end of beadwork and also to connect Clasps. Any stone made up of two component parts or sections, such as a garnet overlaying green glass. They are often used as pendants. These pliers have removable plastic covers over the metal jaws so that they don’t scratch or mark the softest wire. They are ideal for working with precious metals, coloured metal wirework and for straightening bent or tangled wire. A bead or component which is wider at one end than the other. Similar in shape to a droplet of water with a hole passing through the length of the centre of the bead or at the small end perpendicular to the bead. Above is an example of a vintage Japanese turquoise glass Drop Bead. A spherical pressed glass bead made in Czechoslovakia. No seam line should be visible and it should be optically perfectly round. Above is an example of a vintage peridot Druk Bead. The name given to a thin layer of minute quartz crystals that have formed across the surface of a gemstone. The ability for a metal to be drawn into wire. Is a fibrous aluminium boro silicate mineral which forms vitreous crystals of brown, blue, green and more rarely pink and violet. It was first described in 1881 and named for the French paleontologist Eugene Dumortier (1803-1873). Read more in our Gemstones & Minerals Glossary. Above is an example of Dumortierite. Some beads, notably Seed Beads, are dyed or painted. A surface colourant is applied after the bead has been made. This seems to apply most to some beads of a pink, purple or fuchsia colouring, and the result is that beads of these hues are more likely to fade or have their colouring rub or wash off. A spray of suitable varnish can help to slow the deterioration. UV light (from the sun and fluorescent bulbs) may also fade dyed beads. Above is an example of dyed beads in the form of howlite skull beads. A larger Seed Bead – size 6/0 or bigger. Also known as Pony Beads. These Jewellery Findings come in a variety of styles and finishes, both for pierced and unpierced ears. They are easy to work with to produce a quick piece of jewellery, as there will either be a hoop to attach dangles to, a plate to glue a stone to, or you can thread the beads straight onto the earring. Above is an example of a pair of silver-played flat wire Fish Hook Earwires. A two piece hinged mechanism attached to the back of an earring which closes around the ear lobe with just enough mechanical pressure to hold the earring in place. The outside of the clip can have a setting for a Cabochon or other design. A pain free alternative to having your ears pierced! A pair of vintage raw brass Creole Ear Clips. Designed for pierced ears this is the straight part of the Earring that is passed through the ear. They can have either a loop, a stem, or an ornamental piece to which you the earring design can be attached. A very hard dark brown wood from the Tropics used to make beads as well as other decorative items. Perfect for making quick fashion bracelets or for childrens projects. Simply add beads and knot together the ends (add a drop of glue for extra security). It comes in a variety of colours including clear. Don’t overload our Elastic Thread with heavy beads as it will stretch. Above is an example of an Elastic Thread called Stretch Magic. A gemstone variety of Beryl with a green colour caused by chromium or vanadium. Read more in our Gemstones & Minerals Glossary. Above is an example of Emerald. A decorative technique that sees coloured powdered glass or glass paste fused to metal using heat. This technique has a heritage stretching back to ancient Greece. Above are two patriotic enamelled Union Jack charms. A finding used to attach a single strand clasp to a multi strand necklace. Typically one side of the bar will have a single loop with the opposite side have multiple loops depending on how many are required for the design. A group of gold plated three strand to one strand bracelet or necklace End Bars. Jewellery Components which are used to finish a strand of jewellery. See Cone Ends. Also referred to as End Nippers or End Cutting Pliers. They are used to cut wire. Above is an example of Beadalon End Cutters. Ironically without a cut in sight these are crudely moulded round beads with irregular facets and traces of the mould remaining on the bead surface. A pattern that is carved, etched or inscribed into a surface using tools, stamping or a drill. This usually applies to glass, metal or wood. A round ball like finding that can be opened up and then placed over a strand of beads or pearls and then locked closed. Also known as a Pearl Enhancer. A short length of Chain added at the clasp point of a necklace or bracelet, to allow the necklace length to be worn at variable lengths, or to fit a larger wrist. Above is an example of a silver plated Chain Extender. A loop made of wire or another material that is used as a connector for chains and pendants. Beads with a circle, a dot, or a combination of the two so that it resembles an eye. The intention being to avert the gaze of the Evil Eye. Above is an example of a vintage turquoise Eye Bead in lampwork glass. Above is an example of three vintage brass Eye Pins. The flat face or surface of a cut bead, gem, or crystal. The more facets there are the more the item sparkles as light is reflected off the surface in multiple directions. Are cut to produce multiple flat sides or faces to reflect light and to create sparkle and different depths of colour. Above are three faceted jet black fire polished Czech glass beads. Today these are usually plastic or glass beads with a coating that creates an imitation ‘pearl’ look. These pearls can be very inexpensive but the coatings can rub away or crack over time leaving the plain surface of the bead that was used. Read our fascinating History of Faux Pearls to discover the more unusual products that were used to make Faux Pearls in earlier times. 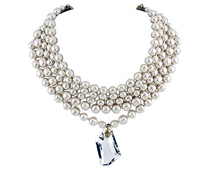 Above is an example of some vintage faux lustella glass imitation pearls. A metal cup or band that is attached to the end of a cord, thread or wire to prevent fraying or simply to add decoration. A reasonably sized pendant with rings on either side through which chain or cord can be passed or attached. This pendant would usually act as the focal point of a necklace. In jewellery terms this usually refers to a decorative metal component with an open lace like structure which is formed by soldering bent wire into delicate designs or alternatively stamping or casting metal into predefined ornate shapes. Above is an example of a bronze finish metal fancy Filigree beading embellishment. Covers all those useful jewellery components that turn a handful of beads and a length of thread into a wearable piece of jewellery – Clasps, Earwires, Crimps, Head Pins, Jump Rings, etc. Also known as White Silver is a silver alloy which contains 99.9% silver or better. Fine silver is softer than sterling silver and is much more brittle. These glass beads start life as a pressed round which is then machine-faceted, it is then placed in a polishing furnace that heats the bead’s surface and softens the facets. The resulting facets don’t have the machine-cut precision of, say, crystal glass beads, but this gives them a charm of their very own. Fire-polished beads do not contain lead, so they are distinct from crystal glass and should not be labelled as such. Czechoslovakia produces beautiful fire-polished beads in a myriad of colours and applied finishes. India produces similar beads but they are generally of lesser quality – the facets won’t meet as neatly and the glass is less reflective. Designed for pierced ears this is a type of Earring Finding that passes through the ear and resembles a hook used for fishing. They can have a loop on the front or a hook from which you the earring design can be hung. Sometimes these are referred to as French Earwires. A type of Necklace Clasp that has a hook like element that fits into the main body of the clasp to secure it. A typical Fish Hook Clasp in gold plated filigree with the pull out hook visible to the left. These pliers have straight sided outer and inner jaws You will need the flat inner jaw for squashing shut crimp tubes, folding down ribbon ends and keeping a good hold of wire when the need arises (wrap your jaw ends in plastic tape to avoid scratching the metal). Used in pairs they can used to open and close jump rings, to hold the wire when wire wrapping and for a multitude of other wirework tasks. Pliers without serrated teeth are preferred as these will not mark the wire. These pliers have fine jaws for delicate work. Above is an example of Beadalon Flat Nosed Pliers. Is an extremely variable stone in terms of colour but has an enviable glassy lustre and richness whatever the colour. They can be an intense purple, blue, green or yellow; also colourless, reddish orange, pink, white and brown. Flourite is the defining mineral for 4 on Mohs Scale of Hardness. These stones can be found in Brazil, Canada, China, England, Germany, Morocco, Spain and the United States. Read more in our Gemstones & Minerals Glossary. Above is an example of Flourite. Are similar to Side Cutters but have a pointed tip so that they can be used to trim wire from hard to reach places. These cutters will cut wire flush and not leave jagged edges thereby avoiding sharp wire ends. Typically they will work up to wire guages diameter 14. A liquid or paste that is used when soldering metals together, both reducing the surface temperature of the two surfaces and protecting the fused metals from oxidisation. A short chain traditionally used with pocket watches, now repurposed for jewellery pieces and in particular charm bracelets and necklaces. An eye-catching centrepiece bead, usually larger than its companions, or used alone. Above is an example of a winged heart lampwork Focal Bead. A transparent or translucent stone that has had its back face coated with gold, silver, or coloured foil in order to enhance the colour and brilliance of the the stone by reflecting back more light. Typically used in costume jewellery and Rhinestones. Three round silver foil backed siam red acrylic cabochons. A glass bead made around a tiny piece of silver or gold foil. The metal foil used can be 24 ct gold, Sterling Silver, or simply gold or silver coloured metal. Genuine Murano glass beads use pure metal and this is reflected in their price. An example of an Indian lampwork glass foiled bead with a black core accentuated by gold foil. Also known as Thong Ends or Cord Ends. If you are stringing with lengths of leather, suede, ribbon etc. you may use these Crimps at the ends of your work. Place the end of your thong or cord on to the middle of the crimp (use a drop of glue if you like), and fold first one then the other of the sides over the centre. They have an end loop. Above is an example of Cord Ends, Folding Crimps, or Thong Ends in black antique finish. Also known as Snap Lock Clasps these are a hinged closure that fold shut with a quiet snap and provide a simple clasp finding for anklets, bracelets and necklaces. Above are a number of vintage copper plated fold over clasps. Also known as Gimp or Bullion. A length of thin wire tightly coiled like a spring. Use a short length of this to feed your thread through at the clasp end, and thereby add some protection to the thread as it would otherwise rub directly on the loop of the clasp. Gives a professional looking finish. As their name suggests form in freshwater mussels in the same way pearls form in saltwater oysters. The difference is they are irregular in shape rather than the perfectly round pearls derived from oysters. Read more in our Gemstones & Minerals Glossary. Above is an example of a Freshwater Pearl. An embroidery technique used to add interest and movement to garments and objects. It can be seen on objects as varied as lampshades to beaded purses and cowboy jackets! It is also commonly used to finish jewellery created with brick stitch and associated bead stitching techniques. Crushed particles of coloured glass applied to the surface of molten lampwork glass beads as decoration. Above are a number of handmade lampwork glass nugget beads with a frit finish. Above is an example of some Frosted aqua glass flowers. Also known as Cane Beads or Candy Beads. Created in a furnace or kiln, glass canes are fused together to create a pattern in cross section. A bubble is blown into the centre of the glass, and then the glass is pulled to create a long hollow tube which may be as long as 24 metres/ 80 ft!. This long cane is then cut into small lengths, tumbled and fire polished to smooth the edges and create a shiny finish. The process is carried out by hand so these beads can be expensive! Beads (especially Seed Beads) that have been plated with zinc or other metals. This type of finish can, unfortunately, be lost over time due to friction or acidity from the skin. You can coat the beads with a spray varnish in order to stabilise the finish and slow down the wear. Is typically a dark red gemstone although they do appear in yellow, green, pink, white and gray. They are found in Australia, Brazil, India, Scotland, Tanzania, the United States and Uruguay. Its most appealing quality is its brilliance. Read more in our Gemstones & Minerals Glossary. Above is an example of Garnet. 34 gauge wire = 0.16mm ( 0.006”) Good for wire knitting and twisting. Too fine for firm shaping. Will fit through the smallest seed beads and pearls. 28 gauge wire = 0.32mm ( 0.013”) Good for wire twisting and knitting. Will fit through smaller seed beads, pearls, smaller semi-precious stones and crystals (2-3mm). 26 gauge wire = 0.40mm ( 0.015”) Good for wire twisting and knitting. Use for semi-precious stones with holes too small for 24 gauge wire, pearls and smaller seed beads and crystals. 24 gauge wire = 0.51mm ( 0.020”) Good for wire crafts and general use including wire wrapping beads and stones. This wire type should fit through slim semi-precious stone holes, seed beads, pearls, smaller crystals. 22 gauge wire = 0.64mm (0.0253”) Good for wire crafts and general use including wire wrapping beads and stones. This wire type should fit through slim semi-precious stone holes, size 11 seed beads, 4mm and larger crystals, smaller metal beads (2-3mm) and glass beads (including Czech glass). 20 gauge wire = 0.81mm ( 0.032”) Good for making jewellery, clasps, findings, wire wrapping (beads and stones), ear wires and jump rings. Will fit through most crystals 4mm and larger, larger seed beads (size 8 plus), larger semi-precious (you may need to use a reamer), and glass beads (including Czech glass). 18 gauge wire = 1.02mm ( 0.040”) Good for making heavy jewellery as long as the bead holes are big enough, and for clasps and findings. Use for lampwork and other large glass beads, also larger metal beads. These are beads made from Precious or Semi-Precious stones. Many of these stones are described in greater detail within this glossary as well as in our dedicated Glossary of Gemstones. Translucent Matte beads with an Aurora Borealis coating giving a beautiful iridescent finish. A pendant earring usually with three ornaments hanging from a central piece. An exquisite example of an antique Girandole earrings by Oliva Collings. Pronounced gee-vray refers to a crystal (colour) or transparent bead with a swirl of interior colour similar to that found in a child’s marble. The beads are usually made using a glass encasing technique before they are pressed into moulds, and then polished. The term appears to have been first used by Swarovski and it comes from the French word meaning frosty. Above is an example of some unusual vintage frosted blue and yellow cut glass Givre Beads. Are those made in a real Murano glass furnace in Venice. They are made using a technique called Filigrana. The glass blower rolls out canes of coloured glass giving the distinctive stripping in each bead. They are then turned as spirals or straight stripping, before being fashioned into into balls, teardrops or pennies. They may also be made using lampwork techniques, or perle a lume as it is in Italian. In this case they begin life as a larger cane of Moretti glass which is then melted into a soft ball on the end of a small blow pipe. To learn more about Venetian glass manufacture look at our History of Venetian Glass and our Glossary of Venetian Glass. Above is an example of a yellow and white spiral Blown Glass Bead. Above is an example of glazed ceramic in the form of a twilight fern heart pendant finished front and back in a glossy dark glaze with vivid blue highlights. Used to keep thread knots from unravelling and to keep small items such as beads in place. Also known as bead cement. Click to view a selection of our beading glues. Means that a Base Metal, such as brass, has been covered with a thin layer of gold, but this layer will be extremely thin and impure. The process by which a thin layer of gold is applied over a Base Metal and mechanically bonded using a combination of pressure and heat. To be classified as gold filled a piece must be at least 1/20 gold by weight. Beads that contain gold foil leaf to add depth and sparkle. Above is an example of a black and Gold Foil Lined lampwork circular cushion bead. A transparent bead with a gold coloured lining to its hole. Not as hard wearing as Silver Lined beads, and the gold coloured lining may be lost over time. Means that a Base Metal, such as brass, has been covered with a thin layer of real gold. This must conform to an industry standard thickness of .15mm to .25mm and of at least 10 carats. 10 carats means that the metal contains 10 parts gold to 14 parts other metals (24 carats is pure gold). See also Rolled Gold and Gold Filled. Above is an example of Gold Plated metal round spacer beads. The unit of measurement used to package small beads such as Seed Beads. 100 grams equals 1 Kilo. An off loom bead weaving stitch which can be used to create daisies, gods eyes, and lightening eyes. It can be used to make rope style anklets, belts, bracelets, chokers and necklaces. A small chain usually 7 or 8 centimetres long that has one end attached next to the clasp of a necklace or bracelet. The other end is attached to a loop or link on the opposite end of the piece. It is used as a fail-safe in case the clasp opens on a necklace or bracelet. Pronounced gee-oh-shay. It is a technique where an enamel finish is applied over a craved metal surface. Gypsum is the defining mineral for 2 on Mohs Scale of Hardness. Read more in our Gemstones & Minerals Glossary. Above is an example of Gypsum. These are beads where a coating has been applied to only one side of the bead. Above are a number of vintage teal glass faceted beads with a half coat of copper surface finish. Simply put these are beads where the hole only goes half way through the body of the bead. There are Findings designed specifically to make use of these beads for varied applications such as for in ring settings, as memory wire end caps or to finish earring posts. Above is an example of vintage Czech speckled green Half Drilled Beads. Serves a similar purpose to the Overhand Knot, and can be used for securing tail ends of threads and weaving in new ones. See the illustration below for how to tie it and read our Guide to Beading Techniques to learn when to use it. A mark stamped into precious metals to indicate its purity or fineness, the maker or sponsor, the Assay Office where it was tested, and the year that it was tested. This process of hallmarking dates back to 1300 when Edward I instituted the assaying and marking of precious metals to reduce fraud and to maintain fair competition. Above is an example of a UK silver Hallmark denoting the maker, the Assay Office, in this case London, and the quality stamp. A jewellery making technique or finish that results in a piece of metal with a pitted surface where it has been struck repeatedly with the jewellers hammer to form a shape or to give surface interest. A hammered metal tear drop stamping in copper. Relates to items of jewellery where individual beads are strung one at a time with a knot placed between them to provide added strength and to avoid abrasion between beads. An obvious example being Pearl Necklaces. A bundle of bead strands, usually 10 to 12 strands of a approximately 18 ins in length. Traditionally the measurement for a hank = 3.333 fathoms or 6.667 yards or 20 feet or 6.096 metres. However this does vary by type and size of bead, manufacturer and country of origin. To learn more about hanks read our Guide To Seed Beads. Above is a hank of cut transparent dark olive Picasso fire polished glass beads. Belongs to the grossularite garnet group. Its vivd orange brown colouring has resulted in the nickname cinnamon stone. Read more in our Gemstones & Minerals Glossary. Above is an example of Hassonite. A long metal pin with an ornamental head used to fasten a ladies hat by passing the pin through the hat and into the hair. A selection of decorative vintage Hat Pins. A short length of wire ending in a ‘Head’ to prevent a bead falling off (a Seed Bead can be used to add a little extra diameter if needed). Once the bead is on the head pin it can then be attached to the larger jewellery piece. Generally head pins end in a tiny round of metal soldered on horizontal to the wire, but look out for decorative Heads including ball heads, decorative metal heads and decorative glass heads. Above is an example of some black antique finish Head Pins. The application of heat to precious stones and minerals to change their physical or chemical properties,, usually with a view to changing colours or improving clarity or hardness. For example applying heat to a blue green aquamarine will make it turn blue. This can be done for aesthetic reasons but also to disguise one stone for another perhaps more lucrative one. Beads and jewellery that have been passed down through a family. Pronounced hee shee are tiny tube or disc shaped beads cut from shells, wood, or ground and polished stones. Originating with the Pueblo Indians of New Mexico. Authentic heishe beads are completely handmade and it can take days to produce a strand of beads. Typically strips of shell or stone are drilled with evenly spaced holes, then cut into squares, before being shaped and sanded by hand. Above is an example of some disc shaped turquoise Heishe Beads from Pueblo New Mexico. Pronounced hee shee bar is a narrow spacer bar used to hold heishe beads, bugle beads or seed beads in parallel without them twisting or tangling. A man made cost saving material manufactured to resemble more expensive natural hematite. It can be magnetised and also used as a base material for various finishes and coatings. Is the mineral form of iron oxide which has a rust red colouring. As gemstone beads they are quite striking and are usually heavy shiny and silvery black in colour. These stones can be found in Bangladesh, Brazil, China, Czech Republic, England, New Zealand, and the United States. True hematite leaves a red streak when scratched across a piece of unglazed porcelain, while simulated products usually leave a grey streak. Read more in our Gemstones & Minerals Glossary. Above is an example of Hematite. Is a zinc containing mineral with its name derived from the unusual character of its crystals – with one end formed of a point but the other being pedion or flat faced without a geometric link to any other faces. Read more in our Gemstones & Minerals Glossary. Above is an example of Hemimorphite. Used in Macrame jewellery, it is a strong and versatile cord derived from the coarse fibre at the centre of the cannabis plant. Above is a ball of Hemp. A stitch where beads are sewn together to create a pattern similar to herringbone fabric. Above is an example of some emerald green hex two cut glass beads. A necklace fastener consisting of two short barrels with screws that connect. This clasp is then partially buried in a bead or pearl, giving the necklace a clean look when the clasp is screwed together. Made from blown glass for lightness or to allow decoration inside the clear glass. This term can also apply to carved beads of bone, stone or wood. Above is a handmade amber coloured hollow lampwork glass bead. A very simple clasp with a long history that is formed with a hook on one side and an open loop on the opposing side. As with many claps the loop is usually circular but can be made to be oval or any other open shape. Above are a pair of hook and eye clasps in a bright solid copper. Is better known for imitating other minerals than it is in its own right. For instance when dyed blue its distinctive veining makes it resemble turquoise. It is a calcium borosilicate hydroxide first discovered in southern California in 1868 and named after Canadian mineralogist Henry How (1828 to 1879) who first described it. Read more in our Gemstones & Minerals Glossary. Above is an example of Howlite. Soft and flexible ‘invisible’ cord, for use in floating and illusion designs as it can be knotted to hold the beads in place (or you can use glue or discreet crimp tubes). Above is an example of Beadalon Supplemax Illusion Cord. A prong jewellery setting containing a faceted metal plate that surrounds the girdle of a diamond or other precious stone, thereby making the stone appear larger. The popular name given to fine quality, translucent, emerald green Jadeite. Read more in our Gemstones & Minerals Glossary. Above is an example of Imperial Jade. A jewellery piece, usually metal or glass, that has had its surface engraved or cut. Metals cast into a bar or other shape for further processing. In the case of precious metals such as gold, silver and platinum they can also be seen as currency or as a currency reserve. Above is an example of a platinum Ingot. A pattern that has been created by setting a material into a surface whilst retaining the overall surface level. Above is an example of an Inlaid Abalone shell pendant. Above is an example of some vintage Japanese red heart green glass beads Colour Lined with an earthy red colour. Is a method of decoration which sees a design cut into the reverse surface of a jewellery piece, such as a glass cabochon or stone. This recessed design is typically found in signet rings. A beautiful vintage monochrome Intaglio ring with a portrait etched into the reverse of the glass at the centre of the ring. Named from ios the Greek word for violet it is a purplish blue hard cordierite mineral. Read more in our Gemstones & Minerals Glossary. Above is an example of Iolite. Natural birthmarks inside a gemstone that can affect its flow of light but can also add uniqueness and character. Depending on the stone in question and the size, shape, quantity, position and colour of the inclusions they can have either a positive or a negative effect on a stones desirability or value. Glass beads traditionally processed with arsenic to create a rainbow or pearly lustre. The arsenic is chemically sealed inside the glass meaning there is no health risk to the wearer. As light catches the surface of an iridescent bead it provides a lustrous almost metallic effect. An Iridescent coating on opaque glass or darker bead colours giving a rainbow or metallic effect. Above is an example of some Czech round glass green, blue and red Iris finish druks. The process of exposing gemstones and minerals to radiation to enhance their colour. A hard, smooth, natural white material derived from the tusks of elephants, extinct mammoths, and sea mammals. It has been used throughout history for beads and other decorative items but with the possible extinction of many of the animals it has been traditionally ‘harvested’ from it is now illegal to trade in new ivory. Synthetic alternatives are made from Plastic, Celluloid and Casein. A necklace fastener consisting of two short barrels which connect by means of a male and female screw. Also known as a Hidden Clasp. Has been a highly valued gemstone for thousands of years especially in the Orient and in particular in China. Colours are a variety of green hues, off white and yellow. These stones can be found in Australia, Canada, China, Guatemala, Japan, Kazakhstan, Myanmar, Russia, Taiwan, the United States, and Zimbabwe. In 1863 it was discovered that the name Jade was being applied to two distinct minerals. These two minerals, Nephrite and Jadeite, are relatively hard to distinguish from each other and so the name Jade has persisted. Nephrite, is an amphibole silicate and usually displays only green and creamy white, whilst Jadeite, is a sodium aluminum silicate and can have the full range of jade’s colours. Read more in our Gemstones & Minerals Glossary. Above are examples of Soft Canadian, China, Green, Lavender, Nephrite, New, White, and Yellow Jade. Is a member of the quartz family and is one of the oldest known gemstones. Because Jasper is found in many colours it is often named by appearance, for example Leopard Skin Jasper. Its main features are stripe, circles or spots with colours ranging from white to gray, pink, red, brown, yellow, and green. These stones can be found world wide, but the primary sources are Australia, Brazil, Canada, Egypt, India, Madagascar, Russia, the United States, and Uruguay. Its polish might wash away in water, so clean with a soft, dry cloth. Read more in our Gemstones & Minerals Glossary. Above are examples of Biggs (USA), Blood, Brecciated, Chinese Painting, Deschutes (USA), Firewood, Florence, Imperial (Mexico), Kambaba (Madagascar), Leopard Skin, Morrisonite (USA), Noreena (Australia), Ocean (Madagascar), Opal, Owyhee (USA), Peacock, Picasso, Picture, Polychronic, Poppy, Rainbow, Rainforest, Royal Sahara Picture (N Africa), Russian, Sagebrush, Silver Leaf, Spiderweb Imperial and Yellow (China) Jasper. Is petrified coal or more precisely the product following the decomposition of wood under high pressure from millions of years ago. It is easily shaped and polished and is considered to be a minor gemstone. Read more in our Gemstones & Minerals Glossary. Above is an example of Jet. A small flat metal disc or tag finding that is added to a piece of jewellery having first been stamped with the makers mark. Above are two large jewellery tags in stainless steel. In general this is aluminium, brass, copper, silver, gold, silver-plated, gold-plated or gold-filled wire. This wire is sold in several sizes, called Gauges, with the larger gauge wire being smaller in diameter. You can buy coated wires in all sorts of fabulous colours. Above is an example of Copper Jewellery Wire. A peg board or base plate with an arrangement of holes into which pegs are placed to allow wire to be bent into specific repeatable shapes. Typically used to create earrings, pendants, spacers or ornate clasps. Circles of wire or metal with a split in their diameter used to join together jewellery elements. The rings can be opened with pliers and used to add jewellery making components to each other and then closed shut to create a relatively secure closure. Above is an example of open silver plated metal Jump Rings. The same circles of wire or metal as detailed above but in this case they have been soldered closed to be used as connectors. These rings cannot be opened and are therefore very secure. If you found this bead glossary useful please provide your feedback as it helps us to gauge the resources that matter to you most. Please feel free to reproduce this beading guide for personal or educational use, crediting Big Bead Little Bead as the source. To reproduce this guide for commercial use please Contact Us to discuss your requirements.